There is no doubt that tots love the strong beats and high energy of hip hop and pop music. But are you concerned about the content in a lot of popular music? Not wanting junior to repeat some of the less then "grandma friendly" lyrics at your next family brunch? Here are some of my favourite tot friendly Hip Hop music picks, sure to keep them busting a move AND singing along to without raising any eyebrows. Album: It's Hip Hop Baby: Fruit! Why I love it: " Exercise! That's what we do! Exercise! You can do it too! Exercise! It's lots of fun! Exercise! It's good for everyone!" Daily physical activity is something I believe we need to be talking to kids from at a young age. The key to keeping kids active is to make sure they are having fun! This song gets kids moving through a series of exercises such as touching the ground, jumping, stretching, and running along to the Hip Hop beat. Why I love it: I love ALL of Christopher "Zondaflex" Tyler's kid friendly Hip Hop. A hip hop instructor and music producer, he has created fantastic music specifically for teaching younger and older children Hip Hop dance. All the lyrics are designed to teach kids how to do the dance routines. He understands how to create music that keep kids feeling cool, but parents and teachers comfortable with the content. I am super excited to do a modified version of the dance below with my Fit Hop Totz classes at J'Adore Dance this session! Why I love it: Kids just seem to love it when chipmunks sing (or the guys that did that hamster dance song... sorry if that is stuck in your head now). The music producers of the new live action Alvin and the Chipmunks movies hit the mark with the mix of chipmunk voices and top 40 pop songs. But my favorite is a remix of the original Witch Doctor. Chipmunk vocal, rap interludes and strong beats get kids shaking their "tail feathers" to the beat. Yo DJ! Pump this Par-tay! The last few weekend when I have finally dragged myself out of bed, motivated by my morning chai latte, I have found the girls watching Artzooka on CBC Kids. Artzooka is a arts and crafts show for kids, that reminds me of one of my favorite shows as a child Take Part! Remember? I remember how I vibrated with excitement whenever I heard the theme song for Take Part, wanting to make every craft project they featured and wishing I could be one of the lucky kids on the show. Oh how I longed to get on that show....I see the same craft-lust in Bria's eyes, glued to the screen for the duration of Artzooka, only interrupted when she momentarily shifts her focus on me after each project with the same question " Can we do that?!?" I'll admit I have been a bit behind in the arts and crafts department with my girls for the last few weeks. Don't get me wrong there has still been a lot of drawing, coloring, painting, and dough play, but between a summer of 5-10 art activities a week at camps, Bria starting Kindergarten a few weeks ago, starting our fall extra-curricular classes with the girls, and J'Adore Dance getting into full swing with our fall dance programming, I haven't had the motivation to think creatively. Thank you Artzooka! As I half watched the show this morning, blurry eyed in my chai coma, I noticed Artzooka had a website. Feeling slightly more awake I decided to check it out. I am so glad I did! The Artzooka website has downloadable, pdf instructions for each activity they do on the show. Simple step by step instructions, with full colored photos make it easy to follow along even for arts and crafts novice. There are 75 different activities currently on the site. So even if you aren't local to Canada and can't watch the show, you can still give these projects a try. Reduce, Reuse, Recycle. Many of the projects use household "junk" items to create art like the Flying Fish Wind Sock made from old chip bags and coat hangers. Perspective. Many of the projects challenge young (or old) crafters to look "outside the box" when thinking about how to create and make art, like the Splat Masterpiece. Many of the projects on the site are definitely catered towards older preschoolers and school goers, but I think many could be modified for siblings under the age of 4. Don't be surprised if you are just as excited as your kids to tackle some of these imaginative projects. So thank you Saturday morning TV and Artzooka for inspiring me to get the arts and crafts back into our weekly routine. My goal is to try and do one formal arts and/or craft activity a week with the girls and then share it with you. Alberta's Best Mama Blogger Results and Giveaway Winner! This is my dear friend Jen, the writer behind City and Baby, and the winner of the Modern Mama Alberta's Best Mommy Bloggers Contest! I met Jen a few years ago when she started taking my Mom and Baby dance classes at J'Adore Dance with her first daughter. But it has been the past year when she returned to take more classes with her second daughter (and some adult evening classes for herself) that Jen and I have struck up a fantastic friendship. Here's the thing about Jen, she's amazing! She's one of those people that everyone loves! Jen is 100% genuine, kind, and passionate about the mommy community and our hometown, Edmonton AB. Last year when J'Adore Dance was a drop off partner in the Huggies Every Little Bottom Campaign she helped our studio raise over 13000 diapers and over $1000 cash by collecting close to 5000 diapers herself! Jen's contribution to the community doesn't end at moving mountains (of diapers), she is always first to offer support to community initiatives and celebrate the things that make Edmonton one of the best city's for young families. To create an outlet to share all of her family friendly findings, Jen started City and Baby last fall. It is the best local blog for families with children 0-5! As a working mom Jen gets how busy it is to be a modern family and her blog posts are relevant, concise, and informative. The sleek layout of her blog is easy to read and navigate (which I do almost daily). If you're local to the Edmonton area and haven't check out her fantastic blog yet, be sure to take a peek. You wont be disappointed! If I had to come in second place to anyone, I am so happy it was to Jen! Oh did I forget to mention that Intellidance.ca came in second place? 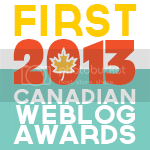 Yup that's right, we were the second most popular blog! And from what Modern Mama said, it was a tight race. Jen's blog inspires and coming in so close in the runnings with City and Baby is a real honour! Thank you for your votes and support! I am very excited that Intellidance will be featured in Urban Infant Magazine's Fall Issue. Don't forget to check out the other Top 10 Mommy Bloggers! And finally.... the winner of the 6 pack of IntelliShakers, done by random draw is.... Danielle Pearson! Congrats Danielle, we are so happy to send your family these great musical toys! Interested in sponsoring a Giveaway on our site? Send me an email to find out how! IntelliSHAKERS: Shake it to the beat! Giveaway! A few months ago I started the process of having our own egg shakers made for our Intellidance programs (and other classes at J'Adore Dance) and to make them available to the families that dance with us. I wanted a shaker that was easy for little hands to hold, brightly colored for visual appeal, and made a pleasing sound. Presto! Here they are: the IntelliSHAKERS! Shakers are one of my favourite toys for ages 0-5. They are simple but have endless opportunities for exploration and imagination. They encourage movement with an automatic auditory stimulus the child controls. They shake it, it makes a sound! Easy to grasp and play, shakers are a great way to expose young children to instrumentation and rhythm development. Shakers are a simple and fun way to support your baby’s eye tracking ability. The shaking noise captures your baby’s interest creating a multi-sensory experience as they follow the shakers with their eyes. Try slower side to side and up and down movements for babies under 4 months of age. Movements can become faster as baby gets older. Keep a pair of shakers at your change table and do a few minutes of eye tracking play at each diaper change. The Grand Old Duke of York Song (video below) can be used as an eye tracking activity for babies. It can also be used as a keeping the beat/action song activity for toddlers and preschoolers by asking them to mirroring the leader. Babies are attracted to movement, color, and sound! Egg shakers provide motivation for babies to lift and turn their heads while in tummy time, roll from back to front and front to back, reaching and grasping development, and creeping and crawling towards the shaker. The video below shows how we engaged baby Lauren in a roll using a shaker as motivation. Turn on a song with a strong, easily identifiable beat. For babies tap the shakers on different body parts to the beat. Try slowing down the taps to half time or speeding them up to double time. Try rolling the shakers along their backs or tummies. By reinforcing the beat through both touch and sound you will nurture your baby's rhythm development. For Toddlers and Preschoolers have them copy you as you keep the beat on different body parts with your shakers. Change the tempo (fast or slow) or make up rhythmic patterns (slow, slow, quick, quick, quick) to challenge their motor and musical skill development. With 4 and 5 year olds, take turns being the leader and follower and pass the beat! Shakers can easily be integrated into action songs and musical play. Two of our favourites can be played along with Asheba's No More Monkeys and Sharon, Lois, and Bram's Tingalayo! Try adding shaker play to your child's favourite songs. Just turning on the music and shaking, dancing and playing along is an activity your kids will love to do over and over again! Mouthing the Shakers: With a studio full of babies I prefer egg shakers over maracas with stick handles as you know the first place the shaker is going is in the mouth. No long sticks = no choking hazard! In and Out: With so many of my instructors bringing their 1-2 year olds to meetings and training sessions I have seen how much enjoyment this age group gets from simply taking the shakers out of a container and then dropping them back in with a satisfying crash! Spinning Tops: A couple of little guys from my Fit Hop Totz class figured out if you spin the shakers fast enough they will spin like a top! Zoom Zoom: Shakers also make wonderful "cars" and "trains". Nose Rolling and Neck Carries: We did a relay race at one of our camps this summer using the shakers. First the kids used their noses to roll the shakers across the dance floor and then carried them under their necks on the way back. Leave a comment below by September 9th and you'll be entered in a random draw for a set of all six IntelliShakers, Sunshine, Cherry, Blueberry, Grape, Lime, and Cotton Candy (retail value of $21). Must be a resident of Canada or the USA to win. Musical Mondays- Songs for the Summer! Summer brings hours of playing in the sun, frolicking in sprinklers, sticky popsicles fingers, blowing bubbles, and chalking up the neighbourhood sidewalks! But what do you do when the forecast calls for rain for a week? Bring the beach party into the house! Whether you're trying one of the 50 Creative Ideas for Summer Fun or just need to dose to Daily Dance Parties, here are some tunes that will keep the sun shining in your heart. Why I love it: The ultimate surfing song, kids love the driving melody line. Even without words you can't help but sing along! Stuck inside? Take the kids on a surf ride! Get out a sturdy blanket or sheet and have your kids sit or lay on their tummies while you pull them around on a smooth surface. For babies this can be a fun way to work on tummy time and core strength, just go slow! For the older kids slide them around as fast as they are comfortable and safe. Bonus, you get in some cardio and upper body/core toning! Why I love it: Maui is always the top of my list for places to visit. We have been a few times as a family and each time we go we wish we could stay forever. The scenic beauty, the beaches and the focus on family make it the ideal vacation destination! But until I can make Maui our forever home I will have to settle for songs that bring back the memories of my favourite island. Before you listen to the song play Going on a Vacation with your kids. Take turns imagining all the things you would pack! Or draw a beach picture and let the music inspire you. If you're feeling really inspired cut strips up a garbage bag, decorate with paper flowers, tie around your waist and voila! A hula skirt! Why I love it: This song makes me smile. It doesn't matter how down I'm feeling, if I turn on this song I instantly cheer up! I have noticed it has a similar positive influence on the families I teach at the studio. So if rainy summer days are getting you and your kiddos down, turn up this song and just dance! I promise you'll be smiling (and sweating) in no time! © Copyright 2017, Intellidance Inc. All rights reserved. Intellidance is a Registered Trademark of Jessica Baudin-Griffin.